As commercial office space reaches saturation and commands record prices in San Francisco and Silicon Valley, one fast-growing startup is stretching out in a suite within a lush campus replete with zen gardens, an indoor basketball court and an Olympic-size swimming pool. But PayStand CEO Jeremy Almond isn’t being cavalier with his investors’ money—their office space comes at 50% of the cost of a similar space in the congested corridor just to the north of their new location in Scotts Valley. 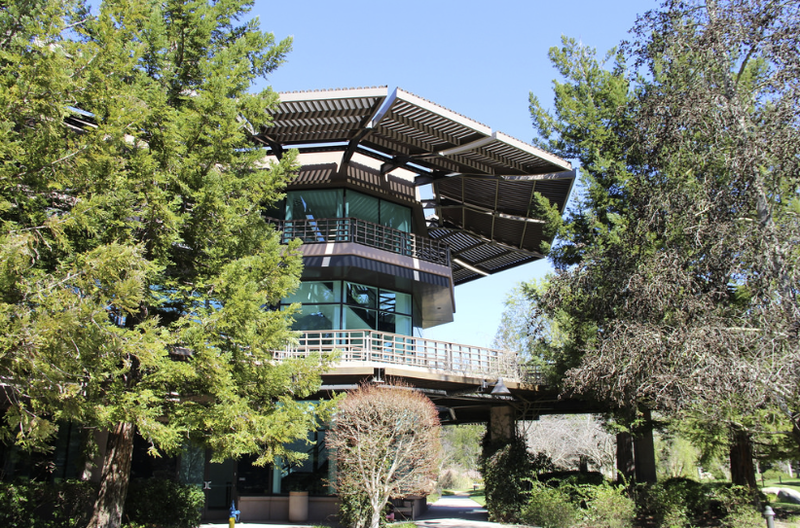 The 24 acre campus was built in 1993 as the headquarters for Borland, one of serial entrepreneur Philippe Kahn’s early software ventures, at a cost of $120 million. Kahn chose award-winning architect Kevin Roche to realize his vision of a peaceful, park-like campus with Japanese influences and sprawling gardens that blend into the surrounding redwood forest. When Borland vacated in 2007, the complex went unoccupied for 7 years, until Chinese investor Hong Bo bought the property in 2014 for only $12 million. Now dubbed the “Enterprise Technology Centre,” the owners are leasing turnkey office spaces to multiple tenants at $2 per square foot, which is far below average for the region. It didn’t take long for startups to take notice: Intuvo, a company with a CRM solution for mortgage companies, was one of the first to move in, followed by several other companies still in stealth mode. The result is a kind of self-organizing incubator, where startups can leverage the Centre’s convenient location just off Highway 17 and high-end amenities to recruit engineers and executives who might otherwise be reluctant join an early-stage company. Less than a year after their product launch, PayStand had outgrown their duplex space in Santa Cruz’ Old Sash Mill complex.